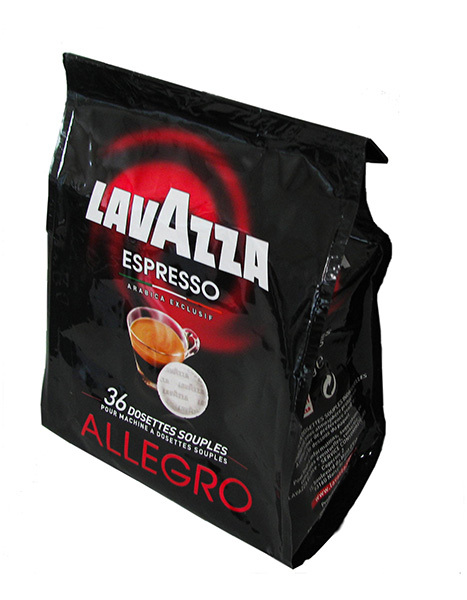 Luigi Lavazza SpA has altered the design of the packaging for its Allegro range of coffee in soft pods for export. The previous packaging, composed of a multilayer PET-aluminium-LDPE bag, which featured a system whereby one could re-seal the coffee after opening, was modified to eliminate this latter component (known as a “tin tie” - HDPE-iron wire-paper). This change reduced the amount of raw materials used by 8%. The improvement in the studied parameters is due to a lower environmental footprint thanks to the reduced amount of raw materials used in the packaging compared to previous types.